Product specifications: Size: 6 * 1.6 * 5 inches Line length: 41.7 inches Wattage: 30W Beam angle: 150 degrees Protection level: IP66 waterproof and dustproof Material: aluminum Installation: 180 degree adjustable bracket for easy positioning and easy installation on walls and floors. The package includes: 1 * 30w UV flood light 1 *30w user manual Application: LED UV floodlights can be used for fluorescent materials, facial and body paints and fluorescent lamps to illuminate dark effects, resulting in different party effects. Suitable for body painting activities, gyms, clubs, bars, graduation parties and dark parties. Use the USA 3 plug and switch. 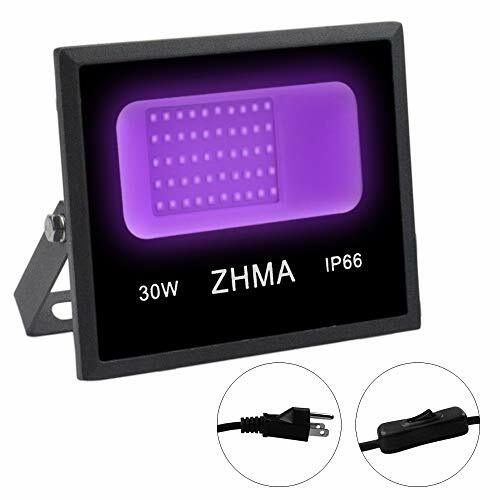 Color: Black 30W Romantic Purple Flood Light Materials: Qualified aluminum housing and glass, using materials that are harmless to the human body and environmentally friendly. The panel uses high quality and high transmittance hard glass mirror materials to maximize the light concentration in the desired illumination area. Waterproof: IP66 advanced waterproof rating, dustproof and waterproof, suitable for indoor and outdoor use.